"After the Cedar, the Cipre is the most precious wood; some say it’s incorruptible. … Its wood is a beautiful reddish color; it is tender, lightweight, soft, smooth. … It does not split itself but only and easily under the tool of the worker. … It is a wood that lends itself to whatever is asked of it." Le Page du Pratz noted its use in the manufacture of pirogues, one of the most important means of transportation in this environment. He gives us one of the few written testimonials that tell how the wood was carefully burned and then dugout to form these boats. Without them it is difficult to see how one could move efficiently in swamps. Since then, our ancestors learned or discovered other uses for this wood without equal. Settlers incorporated cypress throughout constructions. The cypress shingle formed a watertight seal against the frequent rains. We understood that a good way to avoid flooding, to let air flow underneath and to protect them from insects such as termites was to lay the buildings on cypress blocks. After fifty years, cypress produces a sap that makes it impervious to water and insects. That is why, like their cousins the redwoods on the West Coast, the cypress can live for hundreds of years or even a thousand or more, and reach heights that make your head spin. Since cypress grows in water, it has developed a unique root system. 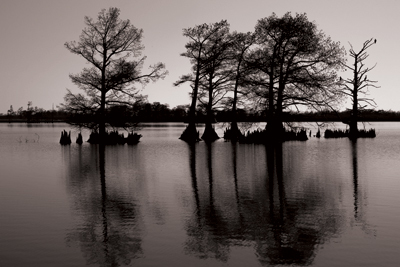 One could think that the "boscoyos", or cypress knees, protruding from the water around the tree are young shoots. They are part of the root system and jut out of the water to take in oxygen. It is best not to cut them. Its wet habitat is ideal for another emblematic plant of the Atchafalaya: Spanish moss. Many families made a living from harvesting moss and cypress. Henry Ford was a big buyer of moss to stuff the seats of his cars. He demanded that it be shipped in cypress crates. Always the shrewd businessman, he procured the beautiful wood for running boards and dashboards for free. Loggers numbered in the thousands, so many trees there were to turn into lumber. They chopped down trees so big 10 or more men could not go around the base. They worked so fast, hundreds of trees sunk to the bottom of the water, without the means to fish them out until today. Carpenters value the recovered logs for their exceptional character. Long stays at the bottom of the Atchafalaya did not hurt that reputation of being rot-proof. Rather, these trees live a second life in the most elegant homes. Old dilapidated barns are also a good source of cypress. In order for this wood to achieve the full resplendent quality it is capable of, you must give it time. It goes without saying that if we want to have a millennial tree, it takes 1,000 years. It seems that there are still some of these old giants left in the far reaches of the Atchafalaya, but it is better just to leave them where they are and recycle those that have already been used. Designated as the official tree of the state, the Bald Cypress represents the qualities to emulate. If only we could require that all of our politicians be like it, incorruptible.